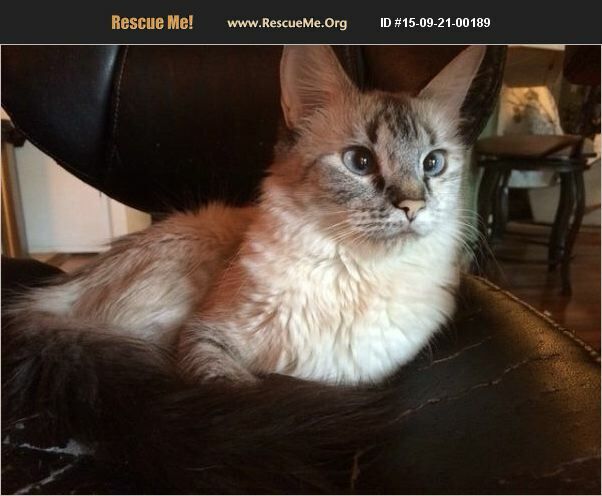 **WE DO NOT SHIP ANIMALS** Phoebe is 2 years old and a Birman mix, Lynx point. Father-Siamese, mother-Birman. Though full grown, Phoebe only weighs 6 lbs. She has had testing done to determine why she is so small, and we've been told, she's just a small cat. She is a strictly indoor cat. She is very shy and it will take someone with patience to adopt Phoebe. She isn't going to allow you to touch or hold her at first. You have to be willing to let her 'do her thing', and come to you. Once she feels totally secure, she will sit with you, sleep with you and will love it when you pet her. Phoebe is spayed, UTD on vaccinations and microchipped. We do not adopt to families with children under the age of 7. Adoption Application, Adoption Contract required. Vet/personal references checked. If you would like to inquire, please feel free.